Tim Burton’s The Nightmare Before Christmas is a difficult movie to describe. But if you have never seen it before then you really should watch this Disney classic movie. The story of The Nightmare Before Christmas centers around Halloweentown resident Jack Skellington. He is shocked to find himself in a bizarre and fascinating alternative universe named Christmastown. THe Nightmare Before Christmas is visually stunning. It is difficult to believe that this movie was made in 1993 which was a time really when the new age of animation was in it’s infancy. Tim Burton made a truly groundbreaking movie which has held it’s popularity for almost two decades for good reason. Right now there is a great deal to get the The Nightmare Before Christmas (Three-Disc Combo: Blu-ray 3D / Blu-ray / DVD / Digital Copy) for just $19.99. The list price is $49.99. The Nightmare Before Christmas is rated PG. Some younger children may find it a little scary so use your judgement as to how old your child has to be to watch Nightmare Before Christmas. We consider that our knowledge of Disney movies is pretty good but we were surprised to learn recently that The Nightmare Before Christmas was not directed by Tim Burton. 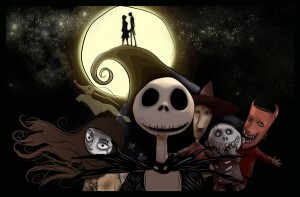 It was of course written and produced by him so it is very much a Tim Burton movie, but the director was Henry Selick. Tim Burton originally wrote the story idea as a poem. 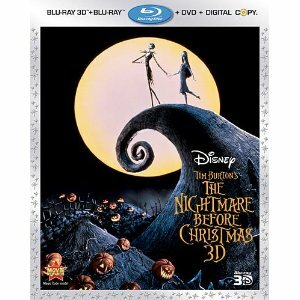 The The Nightmare Before Christmas (Three-Disc Combo: Blu-ray 3D / Blu-ray / DVD / Digital Copy) has some great extra features including Deleted Scenes and A Making of The Nightmare Before Christmas feature. If you are a fan of Tim Burton these two classic movies The Nightmare Before Christmas (Three-Disc Combo: Blu-ray 3D / Blu-ray / DVD / Digital Copy) and Frankenweenie should most definitely be on your Christmas list!